In 2006 A.D., two ambitious lads sitting in the vaults of an old distillery right in the heart of the corn town Nordhausen decided - on a cosy drinking evening - to end their cheerless guitar playing in the pub. 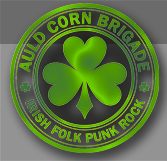 So they grabbed a drummer and a female vocalist - this was the foundation of a band with the aim to combine Irish folk music and subculture punk music to pursue idols like The Pogues, Dropkick Murphys and others. Now, the founders comprised of Nicole, Nico, Stefan and Uwe were complete. Later on, also bassist Henry and accordion player Jimmi joined the band. This line-up played several concerts until Henry left the band. Whilst looking for another bassist, this slight setback resulted in a break that we spent every week at the jam practice room. Thanks God, this hard time at the practice room was enlightened by a new band member. In 2007, Marlen and her fiddle joined the band and enriched the band's music. More than one year after Henry leaving the band, also Eileen on the bass joined our band. And then started the time of practicing and practicing and ... The band worked towards new concerts and studio recordings. All went straight ahead, when guitarist and founder member Stefan left the band in 2008 - and was replaced by Weisi, who now has the main part in guitar playing. After everlasting practicing, the band had its first concert for more than 2 years - on 9 May 2009. However, the comeback and the joy were only short - our bassist Eileen left the band. Simultaneously, the band broke up with their accordion player. The bass was soon played by postman Klaus from far-away Saxony - and all concert could be played as scheduled. ... so it was going on and on. And in the years 2010 and 2011 we went to Goettingen to record some new songs. They will be published on an EP in April 2012. We slowly break away from traditional songs and publish our first 2 self-composed songs on this Shortplayer. Traditional folk songs are revamped with influences of punk, Southern rock, country music, and classical music. Lyrics are a mix of pub songs, love songs and rebel songs. Irish influenced, provocative, honest, political Punkrock.